The most effective hearing protectors on the planet also happens to be the most cost effective. No kidding. 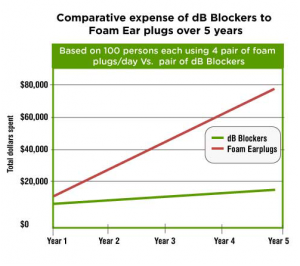 The dB Blockers™ are hearing protectors made to fit the individual’s ear exactly, this gives the worker a custom fit earplug that they can wear all day long, while receiving “REAL WORLD” (what the wearer actually receives) attenuation. See how easy it is to wear a dB Blocker hearing protectors. 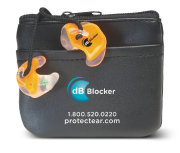 dB Blockers™custom molded earplugs are made from the Skinsoft™ blend of medical grade silicones, which is as soft and flexible as your own skin. See the products page for more information. One of the problems of any hearing loss prevention program is getting people to wear hearing protection and policing their use. However, with dB Blockers™ this is easy because they are comfortable. They only fit the correct way, like a key in a lock so it is not necessary to check insertion. Compliance is easier because the coloured exterior of the custom earplug makes it simple for safety officers to check compliance. See the products page for more information. The proprietary frequency tuned filter allows interpersonal communication without removal. People can communicate in noise better while wearing their dB Blockers™ hearing protectors than if they were to remove them. Your hearing loss prevention program will not interfere with productivity. See the products page for more information.